IFMIF is a projected materials test facility in which candidate materials for the use in an energy producing fusion reactor can be fully qualified. IFMIF is an accelerator-based neutron source that produces, using deuterium-lithium nuclear reactions, a large neutron flux with a spectrum similar to that expected at the first wall of a fusion reactor. Pictured: the Accelerator Facility LIPAc. Qualifying materials resistant enough to withstand the impact of the high-energy neutrons from deuterium-tritium (DT) reactions is of utmost importance for the future of fusion. This task has been assigned to the International Fusion Materials Irradiation Facility (IFMIF), which is in its Engineering Design and Engineering Validation (EVEDA) phase under the Broader Approach Agreement that Japan and the European Union formally launched in 2007. The EVEDA phase of IFMIF was conceived as a risk mitigation exercise for the future facility, consisting among other assignments of providing a design for the IFMIF plant and of working with prototypes to demonstrate the stable operation of the Accelerator, Target and Test facilities, which are the main technological challenges. IFMIF/EVEDA is soundly advancing towards the successful accomplishment of its full mandate. The objectives of the engineering design activities (EDA phase) were achieved in June 2013 on schedule, with the issuing of the Intermediate IFMIF Engineering Design Report. During 2015, the validation activities for the Test Facility were successfully accomplished, demonstrating among other things the feasibility of a temperature gradient within +/- 3 percent at the target temperatures between 250 °C and 550 °C for over 80 percent of the small specimens contained in 12 capsules. (Each capsule is capable of housing two sets of 35 specimens, permitting the characterization of materials at a given irradiation temperature under fusion-neutron-relevant conditions). Engineering validation activities are progressing. In the EVEDA Lithium Test Loop, the specified long-term operation of the lithium flow, with maximum allowable thickness variations within +/- 1 mm, was successfully demonstrated over 25 days of continuous operation, with stable flow at nominal operation conditions with thickness variations within +/- 0.5 mm. A full scale prototype of the High Flux Test Module, with two instead of four irradiation compartments, was studied in the HELOKA loop facility installed at the Karlsruhe Institute of Technology (KIT). 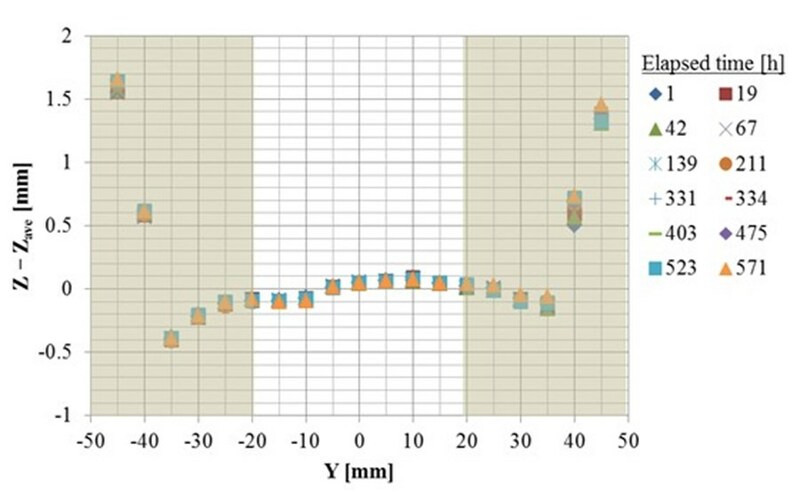 Isothermal conditions <3 percent were achieved in 97 percent of the capsule volume (which was instrumented with 17 thermocouples) at any target temperature within the specified range. Fully featured capsules loaded with specimens were irradiated at the BR2 reactor in Mol, Belgium. 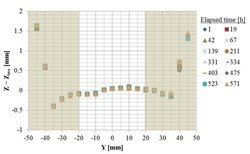 The irradiation tests provided important information for optimizing capsule geometry to ensure tightness and to increase the heater lifetime; also neutron flux monitoring could be validated in-situ. In parallel, the lithium target validation activities have proven that the projected 25-mm-thick lithium jet flowing at 20m/s at the maximum can be realized as the target for the two accelerators, each delivering a deuteron (deuterium ion) beam of 125 mA at 40 MeV in continuous wave (i.e., 100 percent duty cycles) with a beam power of 2 x 5 MW. The specified long-term operation of the lithium flow, with maximum allowable thickness variations within +/- 1 mm, has been successfully demonstrated in the EVEDA Lithium Test Loop (ELTL) over 25 days of continuous operation with stable flow at nominal operation conditions with thickness variations within +/- 0.5 mm. The only remaining activity related to Target Facility validation is the study of corrosion/erosion of the reduced activation ferritic-martensitic steels when exposed to IFMIF-relevant lithium conditions, which is presently being investigated in the lithium loop of LIFUS6 in Brasimone, Italy (ENEA) with eight specimens of EUROFER and F82H under IFMIF-relevant flowing lithium conditions. The Linear IFMIF Prototype Accelerator, LIPAc, is designed to run a deuteron beam of 125 mA at 9 MeV in continuous wave (compared to the 125 mA and 40 MeV of IFMIF). At the Japan Atomic Energy Agency (JAEA) Broader Approach Rokkasho site (the International Fusion Research Centre, IFERC) the commissioning of the deuteron injector aiming at a 100 keV/ 140 mA continuous wave beam designed and manufactured by CEA (Saclay, France), is in its last stages. The radiofrequency quadrupole contributed by INFN (Legnaro, Italy) will arrive in February 2016 to initially achieve a 125 mA deuteron beam at 5 MeV and 0.1 percent duty cycle. This phase of LIPAc commissioning, which builds also on accelerator systems from CIEMAT (Spain)—such as the radio-frequency power source, medium energy beam transport line, and the diagnostic plate—is scheduled to end in May 2017, followed by another phase for commissioning involving the SRF Linac (CEA), with assembly carried out in Rokkasho. A resource-loaded schedule for the accomplishment of the full scope of the Accelerator Facility validation activities was approved during the last Broader Approach Steering Committee #17, hosted by the RFX Consortium in Padua, Italy, on 11 December 2015. The Broader Approach Steering Committee approved an extension that will allow the operation of LIPAc at 125 mA in continuous wave and 9 MeV, at the cutting edge of world accelerator technologies, before December 2019 with no additional credits required beyond those assigned to the Broader Approach Agreement upon its signature in 2007. See more information on the European Domestic Agency website.